$30.00 Website Maintenance Services. No Contracts. No Monthly Fees. Businesses spend an extraordinary amount of money on building a beautiful website and soon find out that maintaining the site is a full-time job. At CMather Web Development, we know what goes into maintaining a website. Our staff of professional freelancers work around the clock to ensure that your website is always ready to make a great impression on your visitors. Who Has the Time for Website Maintenance, Updates and Upgrades? CMather Does! Our low cost site maintenance packages deliver the website maintenance services your website needs. From content management to security, our website maintenance services will ensure that your website always has its best foot forward. At CMather, we make things easy for you. Using our script installation services mean that you don’t need to be a technician to run your site. We install both commercial and open source scripts so you can devote more time to your business and less time to your website. Not sure what your site needs? Let us run a website health check. We can monitor and maintain your website’s, and we apply patches and updates immediately. We can also install new add-on Web Services like blogs, galleries, articles, knowledge bases and wikis at your request. We also work to ensure that your website remains up-to-date and delivers the critical business information your visitors are looking for. Contact us or shout out on our social media sites below. We’ll show you why our fixed pricing for website maintenance fees throughout Australia is safe, reliable and cost effective. Need Help Managing Your Website Maintenance? Revitalise your outdated website! Update and refresh with the latest content. Fixed Pricing Guaranteed. 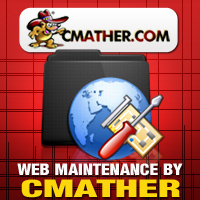 Why Use CMather for Website Maintenance? Backup Files, Databases and Disaster Recovery. Malware or Hacked Site? Clean up and restore. Website Security Auditing and Consultation. Adding fresh content like news and articles. Adding custom photos, graphics and clip art. Content maintenance. Writing article, Content and research. Social Media Management. Manage postings and social maintenance. Traffic Auditing with Google Webmaster and Analytics. Creating XML Site Maps, Robots.txt and .htaccess files. Adding new products and services into your shopping cart. Creating forms, links and additional pages. Cloud maintenance. Uploading documents, photos, files. PHP Script Installation and Web Development. Changing web hosting? Server Migration and Hosting Maintenance. On-Call and After Hours. 24/7 Emergency Support. No Contracts, No Monthly Fees. Just one simple hourly rate for website maintenance and updates. Peace of mind money back guarantee on all site maintenance and script installation services. We quote the exact amount required for the job. No hidden charges! All site maintenance work completed within 24 hours. Professional Project Management, Time Scheduling and Reporting provided. $30.00 AUD PER HOUR. No Contracts or Monthly Fees. The current Industry Standard is between $65.00 – $85.00 per hour. Save over 50% when you use our professional website maintenance services. With our low cost website maintenance fees, you can afford to maintain your website on a weekly, monthly or annual basis.